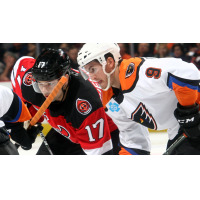 ALLENTOWN - The Binghamton Devils surrendered a two-goal lead in the third period in a 3-2 overtime loss to the host Lehigh Valley Phantoms on Saturday night from PPL Center. Pavel Zacha made his mark on the game in the third period with both sides looking for the first goal. Zacha took a pass from Quenneville and fed Studenic for the lead. The goal was Studenic's fifth of the year from Zacha and Quenneville at 3:13 of the third. Just over two minutes later, John Ramage scored from center ice on Alex Lyon to give the Devils a 2-0 lead at 5:56. The goal was Ramage's first of the year with assists from Michael Kapla and Studenic.